Once you have uploaded your dataset into Datawrapper and selected the short table, you can customize the appearance. Let us show you how to make a beautiful chart in three simple steps. This guide will walk you through the steps necessary to create a short table as seen above. After clicking on the tab "Refine", you will see four panels. Here you can decide by which column the table should be sorted the first time your readers see it. Choose a column that will be either most helpful or interesting to the reader. By default, the biggest value will be at the top. To bring the smallest values to the top, select "Sort ascending". You can also enable readers to sort the columns by themselves. To sort the table once it's embedded in your article, readers can click on the header to sort the column. A small triangle will indicate that this column is sorted. Here you can decide how big or small the typeface in your table should be – in all rows, or just in certain ones. To change the type size of all your rows, select "all" and click on the big A and small A buttons. Afterward, you can select another row to change its appearance. If you want to go back to the default setting, you will need to go through the rows with your change again and de-select them. For our chart, we won't do any changes in this panel. Here you can decide the color of the bars that you can display in all numeric columns (you can turn on these bars in the next tab). We choose red as a color. You can also decide if the bars should animate themselves when the readers see the bar for the first time. It's a subtle effect that makes the table look less static. Also, you can decide how many rows should be displayed. The Short Table works best for 1-10 rows. If you have more rows, they will be hidden by default (readers can still "un-hide" them). To avoid this, you can increase the number in the setting "Hide rows after row number". Finally, you can replace country codes (e.g. :us:) with flag icons: Here you can decide to display little flag icons in the table. That only works if Datawrapper finds indicators like :us: in your data. 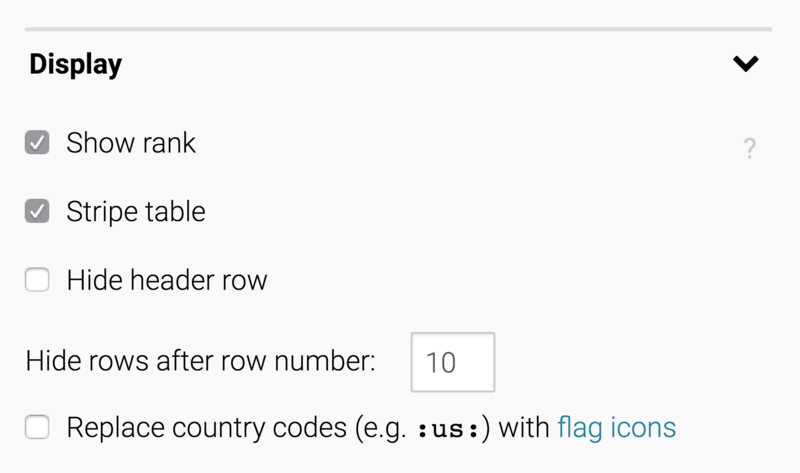 Find more information about flag icons in tables in this article. In the 2nd panel in the "Annotate" tab, we can decide which numeric values should be shown with mini-bar charts (you can choose their color in the "Refine" tab) and which text values should be shown in bold. To do so, select the columns you want to highlight. You can remove the elements with clicking on the "x" in the blue bars.